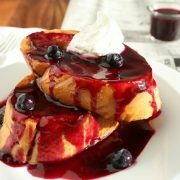 If there’s a breakfast food that you want to try soon, please let these be it! I wouldn’t ever be able to tell you in words how good they are, you just need to try them yourself. 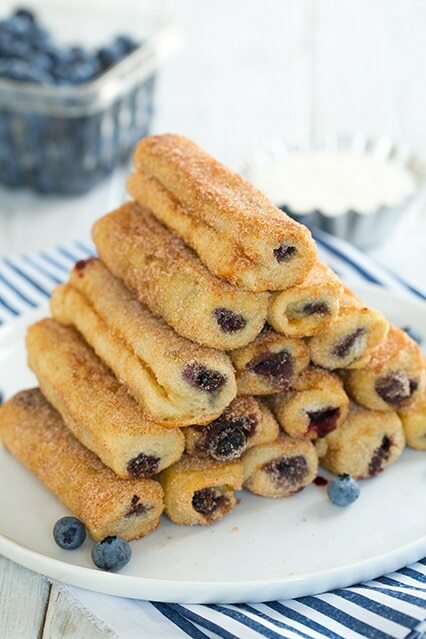 These are basically blueberry cinnamon rolls in french toast stick form. 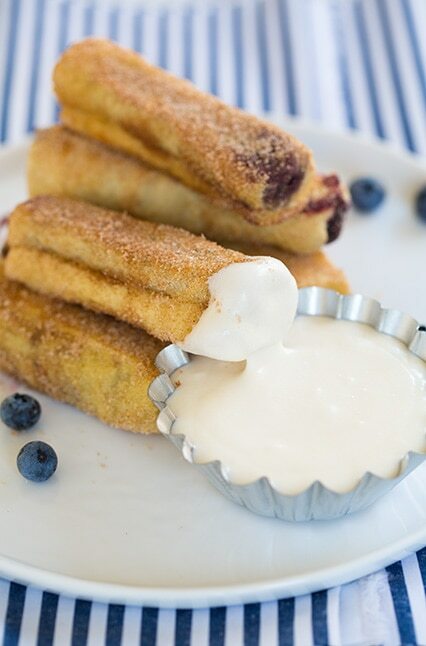 Or, just imagine your favorite french toast turned cinnamon roll, meets blueberry filled, homemade toaster struedel and all of that goodness is then plunged into a creamy, sweet, glaze-like cream cheese dipping sauce. See, you need to try them! I’m pretty sure my family had the entire batch finished in a number of minutes. With these you can add various fillings. I’d highly recommend going the blueberry route at least once, but raspberries, strawberries, diced bananas, chopped nuts, Nutella, sweetened ricotta and chocolate chips (Cannoli french toast roll ups…yes please!) would all be delicious options. Rather than baking these you could also cook them in a fry pan over the stove-top, rotating to opposite side occasionally until cooked through. Baking them all at once just seemed easier to me. You might look at this recipe and think it makes way too many and you might be thinking you want to cut the recipe in half, if anything double it :). The bread is that weak, flimsy bread so these really aren’t that big and everyone will probably want at least 3 or 4. Or all of them. I know I do, if I had any left I’d probably be tempted to hide them in the back of my fridge – out of site of anyone else. Enjoy! 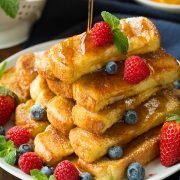 Such a fun new way to make french toast! 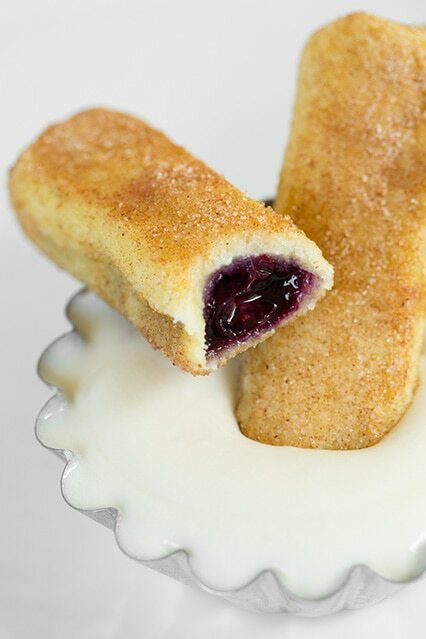 They're filled with jam and fruit, rolled, dipped and cooked until golden brown. Then they're finished with cinnamon sugar. Preheat oven to 375 degrees. Stack bread into stacks of 4 slices, then trim crusts from bread. Working with one piece of bread at a time, use a rolling pin to flatten bread to about 1/2 it's original size. Evenly spread 1 tsp blueberry jam just onto one half of the bread, then align a row of blueberries over jam. Roll bread to opposite end and set aside, seem side down. Repeat with remaining slices of bread. To a blender add eggs, milk, vanilla, flour, baking powder and nutmeg. Cover and blend on low speed 10 - 15 seconds until well blended. Pour into a bowl and dip roll ups into egg mixture, allowing to rest several seconds to absorb liquid. Transfer to a lightly greased Silpat lined baking sheet (I didn't grease mine and I had about 3 of them stick, but was easily able to remove them with a spatula). Bake in preheated oven 9 minutes, then remove from oven. 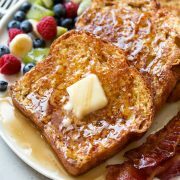 Brush tops lightly with melted butter than rotate french toast roll ups to opposite side and brush lightly with melted butter (bottoms should now be upright). Return to oven to bake 8 - 12 minutes longer until cooked through. In a small bowl whisk together granulated sugar and cinnamon. 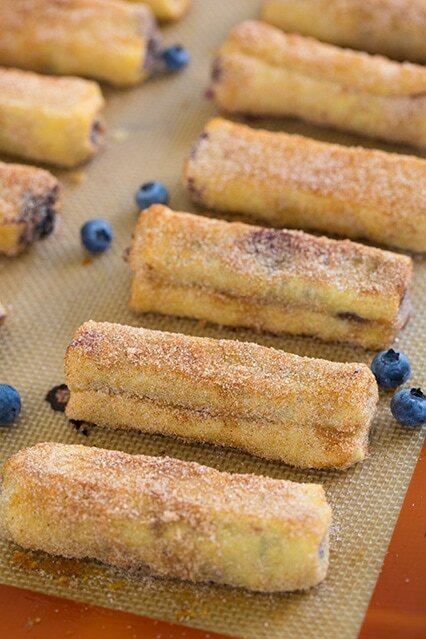 Once french toast roll ups are cool enough to handle, immediately dip and roll in cinnamon sugar mixture to evenly coat. Serve warm with cream cheese dipping sauce. In a mixing bowl, using and electric hand mixer, whip together cream cheese and butter until smooth and fluffy. Add in powdered sugar, milk and vanilla and whip until well blended and fluffy. Store in refrigerator.